Possibly San Diego’s most beloved springtime tradition, The Flowers Fields at Carlsbad Ranch continues its seasonal run through May 12 (Mother’s Day). As usual, visitors can enjoy displays of colorful Giant Tecolote Ranunculus spanning the 50-acre site. The beautiful bursts of blooms are open daily from 9 a.m. to 6 p.m.; tickets cost $18 for adults, $16 for seniors 60+, and $9 for children ages 3 to 10. If you plan on visiting a few times this season, you may want to spring for a season pass ($39 for adults, $20 for kids). Keep an eye on the Flower Fields website, too, as the venue hosts lots of family-friendly, fun events throughout its run, usually on the weekends. The Headquarters at Seaport is a solid place to shop and eat but, if you’re a San Diego history buff, you may want to pop into a free mini-museum located at its core, between the Kitson and Madison San Diego stores. There, you’ll find a fully-restored, 8-cell jail block housing historic photos and San Diego Police Department memorabilia. You see, The Headquarters – built in 1939 – sits in the very complex that served for many decades as the SDPD’s headquarters. The site is listed on The National Register of Historic Places. It was restored and reopened as The Headquarters and Seaport shopping and dining complex in 2013. Read all about the site’s rich history here. 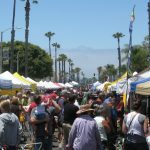 North Park is known for its interesting small businesses and, on Thursdays year-round, local vendors and artisans are showcased at this popular farmers market located on the corner of North Park Way and 29th Street. On the shopping list: farm-fresh fruits and vegetables, meat, eggs, sauces, bread and even handcrafted gifts from local, small businesses. The free event also features live music. Each Thursday, the Oceanside Sunset Market brings about 200 local merchants together for this sunset marketplace spanning four blocks in downtown Oceanside. Shoppers can expect vendors showcasing homemade goods and tasty grub, plus live music and, of course, an incredible ocean view. The free market is located on Pier View Way; rain may cancel the event, so check the weather before making your plans. The crafting pros at Patchwork lead this workshop at Rip Current Brewing in North Park Thursday night where attendees will learn to make a macramé plant holder. A $35 ticket gets you step-by-step instructions, all of the materials, and a 6-inch pot for your plant. Cirque du Soleil brings its high-flying, captivating acrobatics show, “Volta,” to the big top at the Del Mar Fairgrounds, where the show runs through May 5. Set to a melodic score, the show is about finding yourself and cultivating your personal powers. Thursday’s show is at 8 p.m.; tickets start at $65. Parking at the main lot at the fairgrounds costs $17. Based on the book, music and lyrics by playwright Britta Johnson comes “Life After,” a musical centered on a 16-year-old girl grieving the loss of her famous father. The production runs at the Balboa Park venue through April 28. The Old Globe’s Barry Edelstein will direct the American premiere, with choreography by Ann Yee, and music supervisions, arrangements, and orchestrations by Lynne Shankel. For Thursday’s performance, tickets range from $34 to $102 per person. Read more about Johnson’s inspiration for the play here. Spring wildflower season continues in San Diego’s desert region, as desert dandelions, sand verbena and other colorful species blanket Anza-Borrego Desert State Park. Thanks to the consistent rain over the winter, this year’s bloom is robust and vibrant. If you’re planning a trip to the desert to see the flowers, you could start your trip at the Anza-Borrego Desert Natural History Association or the Anza-Borrego Desert State Park Visitor Center, both located along Palm Canyon. Now that we’re in mid-April, the desert bloom will look different than it did at its peak in mid-March, with cacti, desert agave, brittlebush and Ocotillo now taking center stage. Here’s an in-depth guide on where to see those blooms. This pop-up museum experience in Encinitas (220 North El Camino Real) has been gaining a lot of attention for its blissful exhibits inviting visitors to live, laugh and love. The “Love Tour” aims to delight the senses as visitors touch, smell, feel and listen their way through more than 21 exhibits inspired by love and happiness. The displays have also been deemed highly Instagram-worthy. General admission costs $24 for adults and $15 for children ages 4 to 15; kids 3 and under get in free. Hours vary by day; for this Friday, you can pick your time to visit between 10 a.m. and 8 p.m. when you buy your ticket online. 6 p.m. to 9 p.m., 10 Barrel Brewing Co.
East Village brewpub, 10 Barrel Brewing Co., will host a fish fry Friday night, helmed by local fishmonger Tommy Gomes, who will break down a yellowtail live, which will then be prepared by 10 Barrel’s executive chef, Tommy Fraioli. After the demo, attendees can enjoy a golden spotted bass fry and shellfish spread and all-you-can-drink brews. Tickets cost $65, and a portion of sales will be donated to Collaboration Kitchen, a cooking and education event that gives back to food-focused organizations across San Diego County. The Lafayette’s “Film & Float” series – a free outdoor movie screening at the hotel’s pool – returns, this time with the Audrey Hepburn classic, “Breakfast at Tiffany’s.” Attendees are invited to wear their Little Black Dress as they channel Hepburn’s iconic socialite, Holly Golightly. To keep in theme, the event will include fashionable $5 hors d’oeuvres, specialty cocktails, glamorous games and more. Entry is free, but you should really RSVP ahead of time, darling. Blues, rock, guitars: two talents – the Kenny Wayne Shepherd Band and Beth Hart Band – take the stage at Humphreys for this Friday night show. Tickets start at $73. Clint Eastwood’s 2018 film, “The Mule,” follows the story of a destitute octogenarian drug courier as he attempts to re-enter the lives of his daughter and ex-wife. The movie plays on the big screen this Friday and Saturday at Cinema Under the Stars in Mission Hills. The outdoor theater on Goldfinch Street is amid its spring screening season and, since it can be a bit chilly out, the theater offers blankets, space heaters and other amenities to keep patrons warm and cozy. Admission is $18 at the box office, or you can reserve your seat in advance for $20. This may be the most difficult decision you’ll have to make Friday night: Backstreet Boys or ‘NSYNC? DJs at the House of Blues in downtown San Diego bust out the boy band hits from each group all night long at this Club ‘90s event. Take it back to the TRL-era of pop and party like it’s 1999. Tickets start at $15; the event is for those age 18+. Get an up-close look at warbirds, classic aircraft, classic cars and WWII memorabilia at the Warbirds Expo & Militaria Swap Meet this Saturday at Gillespie Field in El Cajon. The swap meet will feature WWII collectibles like books, photos, uniforms, toys and more. Meanwhile, on the expo floor, attendees will have a chance to go inside a real WWII aircraft and can even join in on a 1940s reenactment cosplay contest. If you want to enter the contest, arrive in costume by 10 a.m.; judging goes down an hour later. Admission to the expo costs $5 for adults and $ 3 for youth ages 10 to 17; kids age 10 and under get in free. Spring is in the air – and on full display – at The San Diego Museum of Art. The museum’s annual “Art Alive” exhibition takes over the venue all weekend, showcasing nearly 100 floral interpretations of the works of art on view. The rotunda will also be transformed into a magnificent floral installation, setting the tone for the unique exhibition. The museum will offer kid-friendly interactive activities on Saturday and Sunday for families to do together, too. Tickets cost $25 for adults and $5 for children ages 7 to 17. This weekly event in Little Italy gives you a chance to cook alongside a trained chef while discovering the community’s charming open-air farmers “mercato.” Here’s how the tour works: a chef-guide will walk with you through the market, pointing out local vendors specializing in fresh ingredients. Together, you’ll taste-test items and buy what you need to create your meal before heading to the guide’s home to partake in a cooking lesson. You’ll cook three dishes – an appetizer and two main dishes – and also enjoy a glass of wine and pannacotta for dessert. This cooking tour costs $79 per person, and is usually available every Saturday. More than 35 restaurants will serve samples at this 18th annual walking food tour of San Diego’s beloved Hillcrest community. Foodies will savor everything from Pad Thai to Italian antipasto; those over the age of 21 can also enjoy beer tastings along the way. Attendees can pick up a map of the participating eateries at the Taste of Hillcrest check-in stations at either the Rite-aid located at 535 Robinson Ave., or Rich’s located at 1051 University Ave. A free shuttle is also available for all attendees, which will be making frequent stops around the neighborhood. Tickets start at $30. Green Flash hosts its first-ever Brewdown Beer Fest at its Mira Mesa location Saturday, inviting local brewers to showcase their standout suds. Attendees will enjoy unlimited beer tastings and vote for the “best in show” beer. The festival will also boast food available for purchase, games and lively music. A $35 ticket gets you access to the full fest, including all tastings and a commemorative glass. Downtown San Diego’s Westgate Hotel hosts a three-course afternoon tea (with champagne!) featuring author Whitney Scharer as she discusses her debut novel, “The Age of Light.” The novel is about a model-turned-photographer who forges a new identity as an artist after a life spent as a muse. Tickets to this event cost $65; parking validation will be available for $3 at the hotel. The East Village’s hip Quartyard venue (1301 Market St.) is celebrating its 4th birthday Saturday with its first-ever evARTS Block Party. The party – in collaboration with the East Village Association – will run along 13th Street, off Market Street, and aims to highlight the local arts culture. The event includes craft beer, live music, and pop-up tasting tents. Inside Quartyard, revelers can take part in a silent disco party helmed by back-to-back DJs. Tickets cost between $5 and $10; proceeds will go toward funding the creation of a 6,000-square-foot mural to be created on the Alpha Project wall directly behind Quartyard. The Barrio Logan Flea Market will be dedicated to the late, beloved Tejano superstar, Selena Quintanilla, this Saturday with vendors selling unique goods inspired by the artist, whose 48th birthday would’ve been on April 16. Visit the marketplace from 4 p.m. to 9 p.m. at the Por Vida Café located at 2146 Logan Ave. Another Selena-themed round of the Barrio Logan Flea Market is planned for April 27 at Mercado del Barrio, located at 1900 Main Street. Looking for a good laugh? Try a stand-up comedy show at two prime San Diego venues: downtown’s American Comedy Co. or The Comedy Store in La Jolla. This Saturday night, funnyman Michael Kosta – a correspondent for “The Daily Show With Trevor Noah” – takes the mic at The American Comedy Co., with a 21+ show at 7:30 p.m.; tickets start at $9. Over at The Comedy Store, you’ll get a 2-for-1-type deal when Natasha Leggero and Moshe Kasher co-headline shows at 7:30 p.m. and 9:45 p.m. Those tickets cost $25. Celebrate spring and Easter at Santee Lakes this Sunday. The outdoor event – which goes down at the North Lake 5 events area – will feature continuous egg hunts all day for little one age 8 and younger, plus craft booths, carnival rides, pony rides, food vendors, photos with the Easter Bunny, and other activities. The event itself is free to enter, but if you park at the lake, it’ll cost you $10 per carload. Tickets for rides and activities cost $1 each, and activities will run you between one to 10 tickets apiece. You can also purchase a VIP package here, which includes parking, activity tickets and other perks for $60. Local band Backstage Pass covers hits from the 1960s, 1970s and 1980s at this free lunchtime concert on the patio at Liberty Public Market. To make a day of it, grab a bite from one of the vendors inside Liberty Public Market, take your food to the patio and eat while enjoying the live music. Violin superstar Joshua Bell brings his artistry to San Diego Symphony audiences at Copley Symphony Hall, performing Max Bruch’s hallmark concerto alongside conductor laureate Jahja King. Tickets range from $26 to $65. This annual mariachi festival, sponsored by the Route 78 Rotary Club, features lively mariachi music by several ensembles: The First Ladies of Mariachi, Mariachi Reyna de Los Angeles; Mariachi Sol de Mexico de Jose Hernandez; Ballet Folklorico Tierra Caliente. Before the 3-hour concert, VIP ticketholders can enjoy a “Tacos & Tequila” reception outdoors. Concert tickets range from $25 to $50; VIP tickets costs $100. The festival usually sells out, so snag your passes ahead of time. Proceeds support college scholarships, literacy programs and leadership opportunities for youth in San Diego’s North County. Tex-Mex icon Selena Quintanilla would’ve celebrated her 48th birthday on April 16, so the House of Blues downtown San Diego will throw a party in her honor this Sunday featuring a performance by The Como La Flor Band. The doors open at 7 p.m.; tickets start at $15.